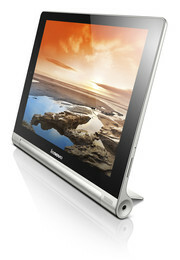 The Yoga Tablet 10 is Lenovo's latest addition to their multi-mode family of products, although the lack of a keyboard means that the tablet can't transform quite as much as other Yoga devices: the 11.6-inch Lenovo IdeaPad Yoga 11S, for example, features a 360 degree flip-and-fold design to convert the Ultrabook into a tablet. 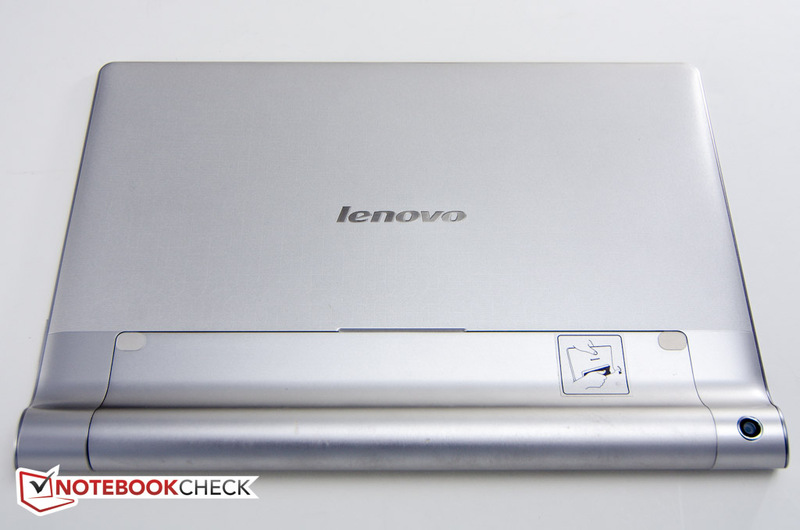 In addition to the Yoga 10, Lenovo also offers a less expensive 8-inch version. 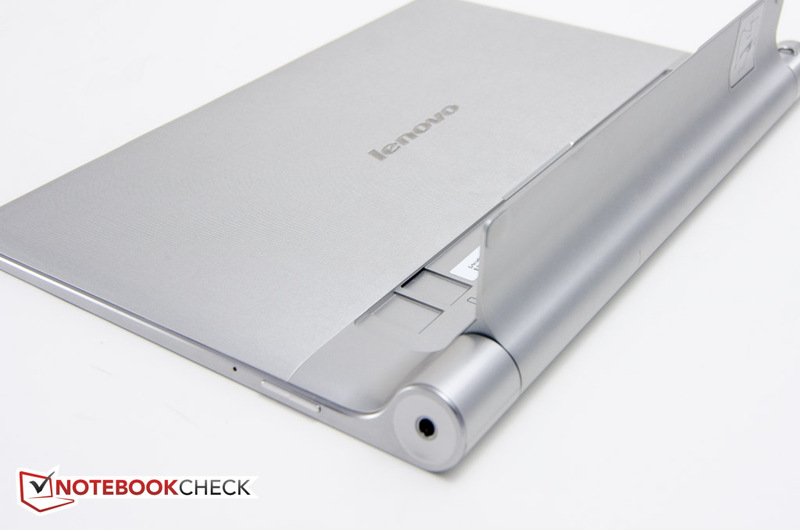 The most unique feature of the Yoga 10 is is the integrated kickstand, which allows the tablet to be used in three different positions, which Lenovo labeled hold, tilt, and stand mode. 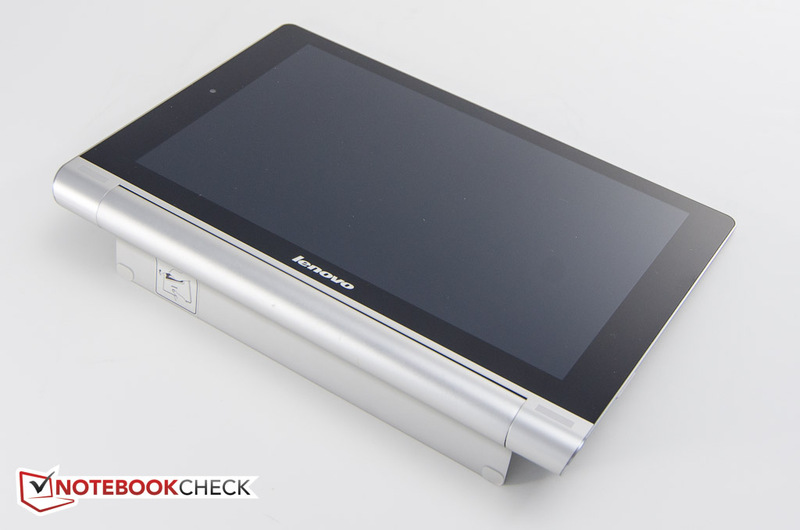 Since ergonomics is "at the heart of Yoga products", Lenovo relocated the battery into the cylindrical portion of the tablet, which not only allows for a higher battery capacity than otherwise possible, but also redistributes the weight closer to the hand gripping the device. 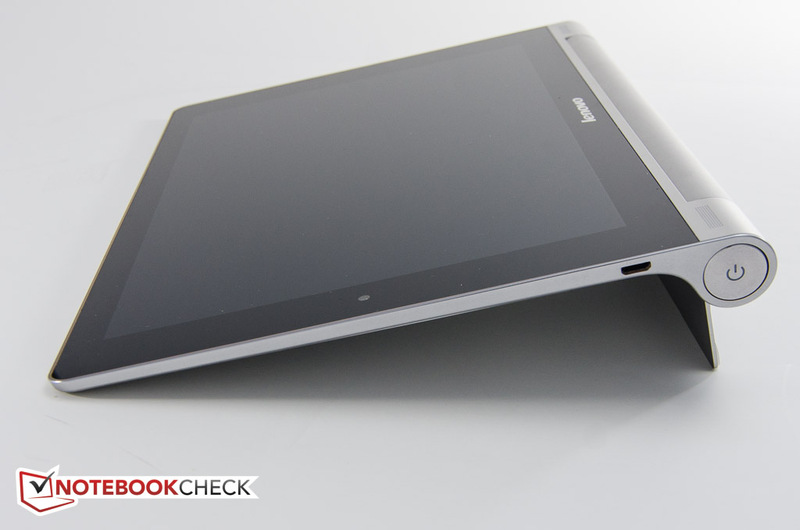 According to Lenovo, this shift in the center of gravity makes the Yoga 10 more comfortable to hold than a regular tablet. The Chinese PC maker outfits their new tablet with a MediaTek quad-core 1.2GHz MT8125 CPU, 1GB of RAM, and 16GB of internal storage, which is not overly generous when compared with standard tablet competitors like the Google Nexus 10, which comes with twice the RAM and storage. Lenovo does offer a 32 GB version for only $10 more at the time of writing, which is certainly a good deal. The 10-inch touchscreen offers a rather pedestrian resolution of 1280 x 800 pixels, which feels especially dated at a time when even 7-inch tablets like the Amazon Kindle Fire HDX 7 offer a resolution of 1920 x 1200 pixels. The aforementioned Nexus 10 ups the ante with 2560 x 1600 pixels; the Asus Memo Pad FHD 10 Tablet offers a still respectable 1920 x 1200 pixels. Is the adaptable design of the $300 Yoga Tablet 10 a must-have for an Android tablet or are conventional slates a better option? 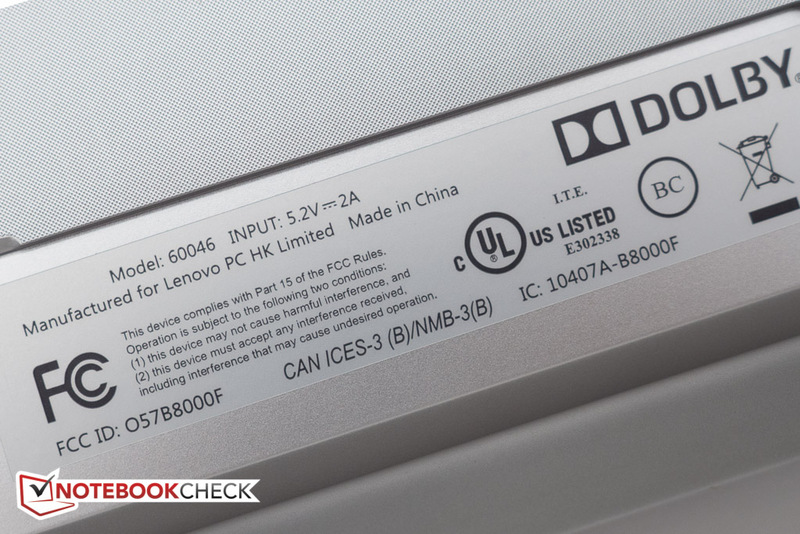 While regular tablets usually adhere to a tried-and-true design, Lenovo does things differently with the IdeaTab Yoga Tablet 10. Instead of a standard slate layout with more or less constant thickness throughout, the Yoga features a cylindrical spine which measures about 21 mm in diameter. 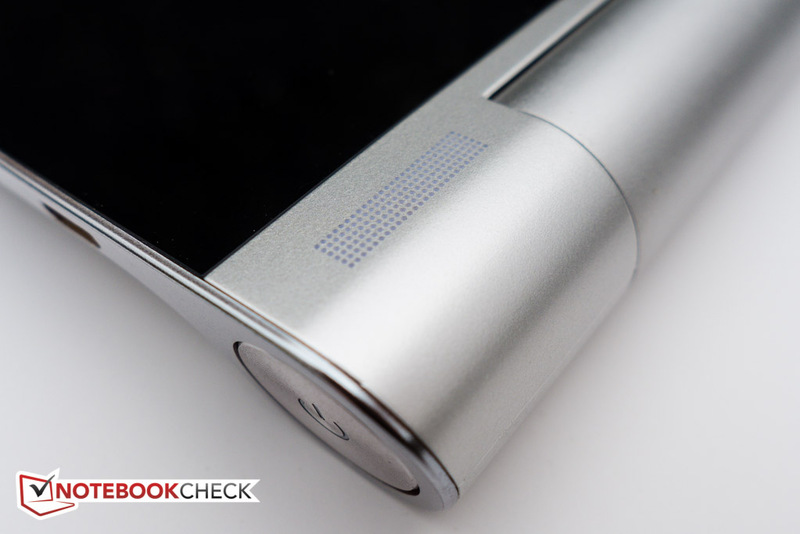 In addition to the kickstand incorporated there, the spine is home to the battery, which allows the rest of the unit to be remarkably slim. Both the overall size of 261 x 181 x 8.1 mm (not including the thickness of the spine) and weight of 610 grams are in line with other tablets: the Nexus 10 measures 263.9 x 177.6 x 8.9 and weighs 603 grams; the Asus Memo Pad FHD 10 measures 264.5 x 182 x 9.5 but is a bit lighter at 571 grams. 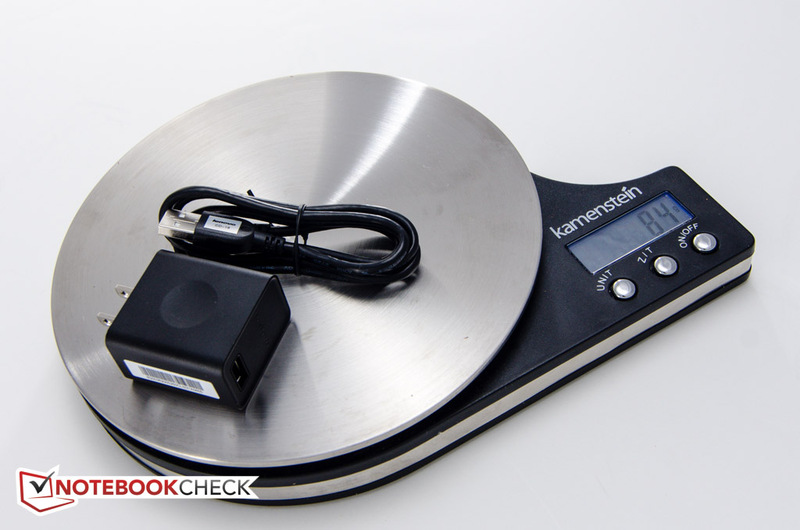 Apple's iPad 4 weighs in at a comparably heavy 652 grams. 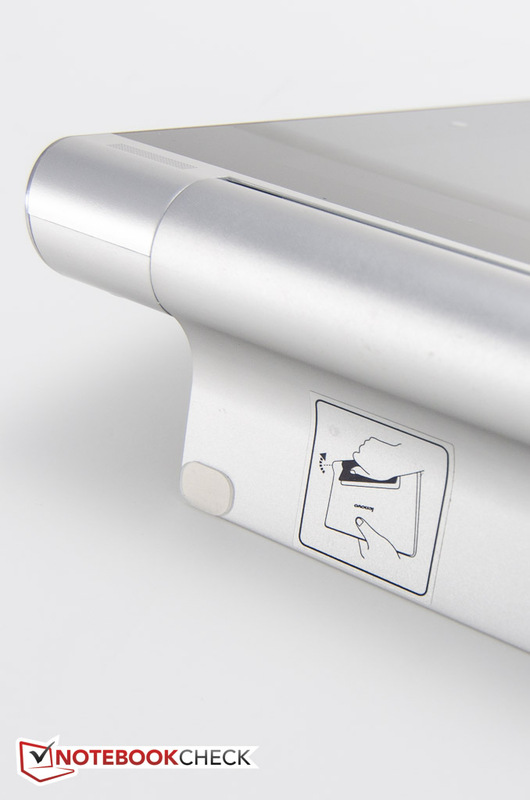 The rather utilitarian design utilizes both metal and plastic: the cylindrical part, the kickstand, and the sides are made from aluminum, while the back of the unit is made from a silver-colored polycarbonate, which is nicely textured and features a modified grid pattern. The build quality is good overall, although both the volume rocker switch and the recessed power button (about 16 mm in diameter) have considerable play. The back doesn't give much when pressure is applied, but twisting the tablet results in backlight changes and ripple effects on the display itself. 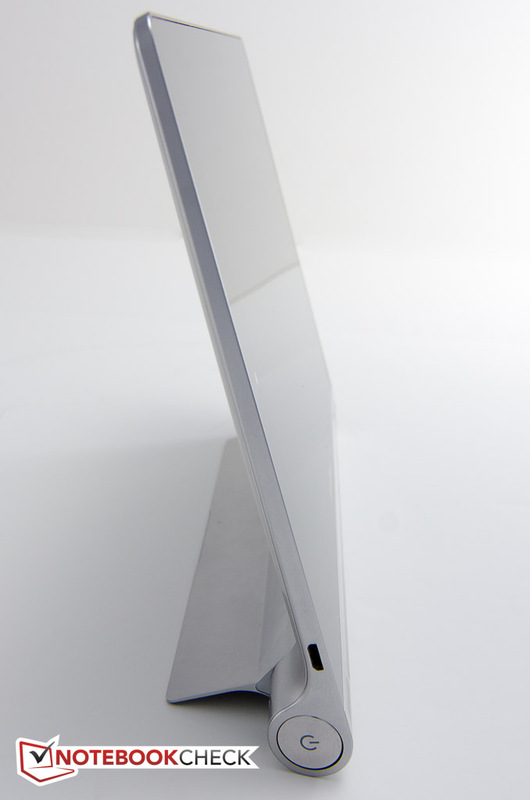 The built-in stand itself sits flush with the back and needs to be gripped firmly with one hand and then rotates away from the tablet into the open position. 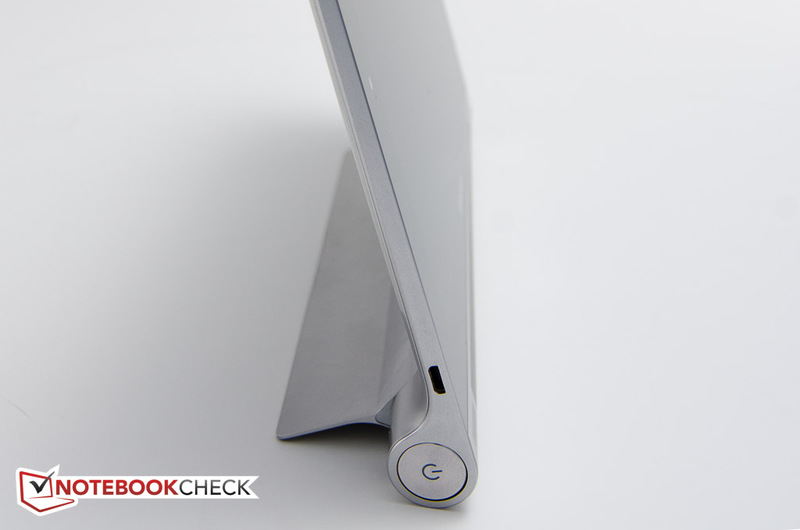 In stand mode, two clear silicone feet prevent the tablet from sliding around too much. 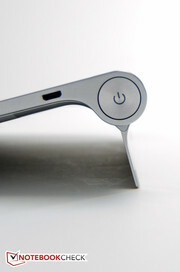 This upright "entertainment" position is ideal for watching movies and other media content, although with the kickstand opened all the way, the tablet only tilts back about 20 degrees, which might be a little too steep for comfortable movie-watching depending on the user's environment. 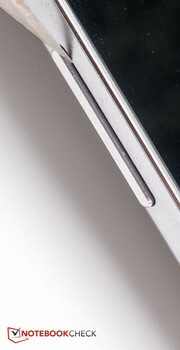 The tablet can be tilted back further, although that increases the chances of it toppling over when the touchscreen is prodded too firmly. 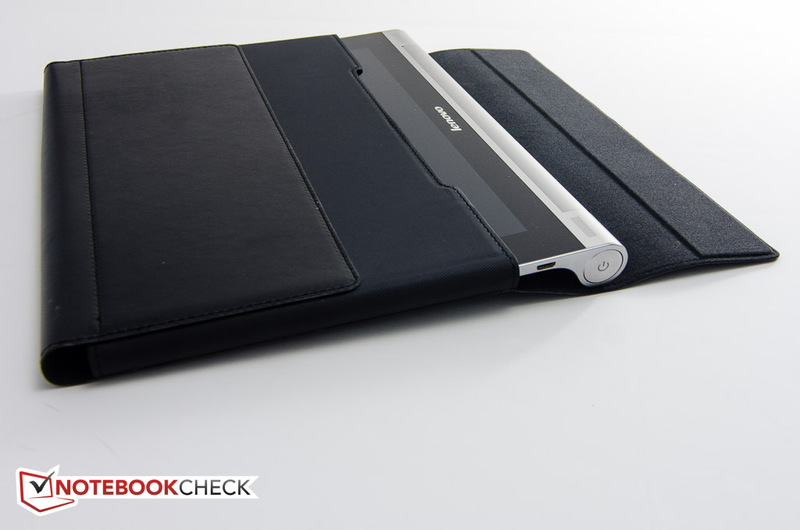 In tilt mode, the tablet is in front of the user while the kickstand lifts the back up at an angle for easy touching and typing. 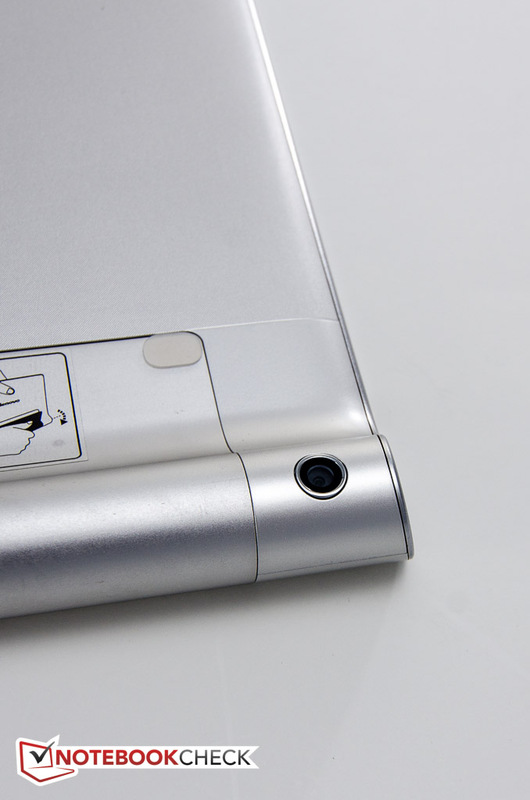 With the kickstand in closed position, the tablet is in hold mode, which is the only way to really use the Yoga 10 in portrait mode, as the other two modes only allow landscape orientation. Each of the modes has a setting in the Android notification tab, which in turn optimizes the content accordingly. We will revisit this behavior later in the section entitled "Software". 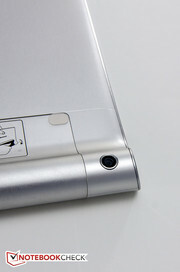 The design features of the Yoga 10 puts most of the weight closer to the hand gripping the device (the center of gravity is at about 35 % of the width), which in theory should make holding it more effortless. 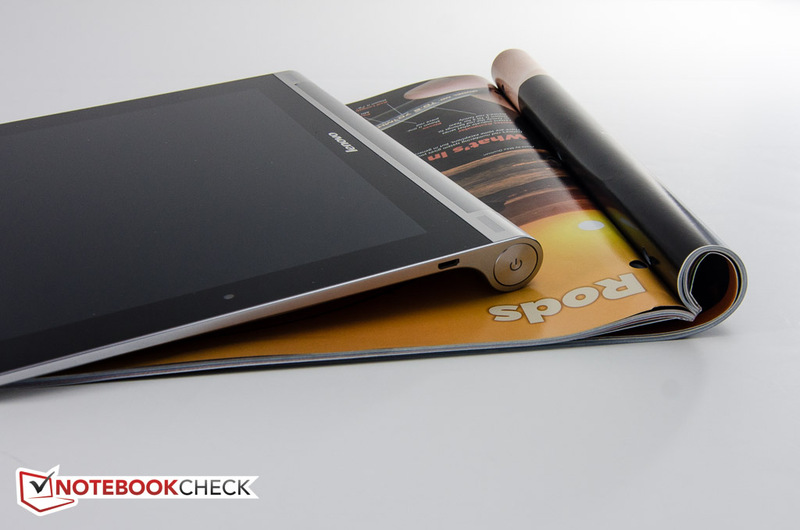 Although Lenovo even states that the Yoga Tablet's design is supposed to mimic a book or magazine, we are not thoroughly convinced that the design emulates the rolled-up spine of a magazine all that well, since the orientation is essentially reversed. For extended one-handed tablet sessions we would have preferred some texturing on the spine lengthwise to give the thumb that rests there some additional grip. 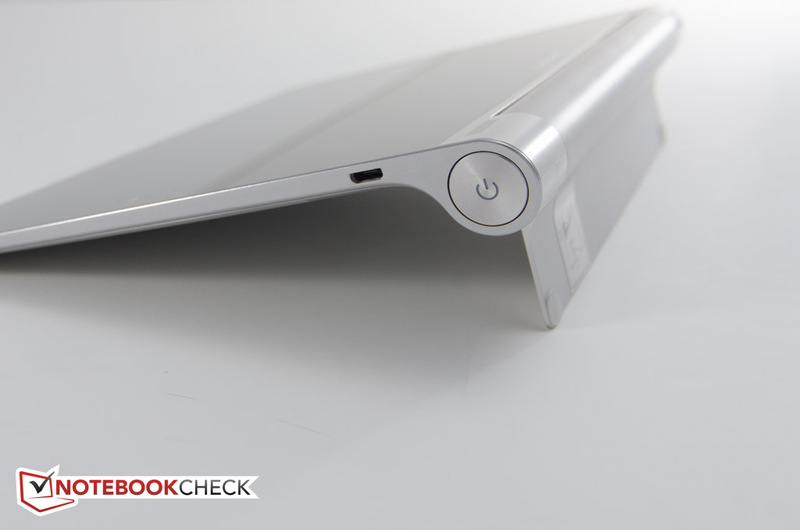 One caveat: with the kickstand in closed position, the tablet only makes contact with the surface its sitting on with the spine and one edge of the polycarbonate back. 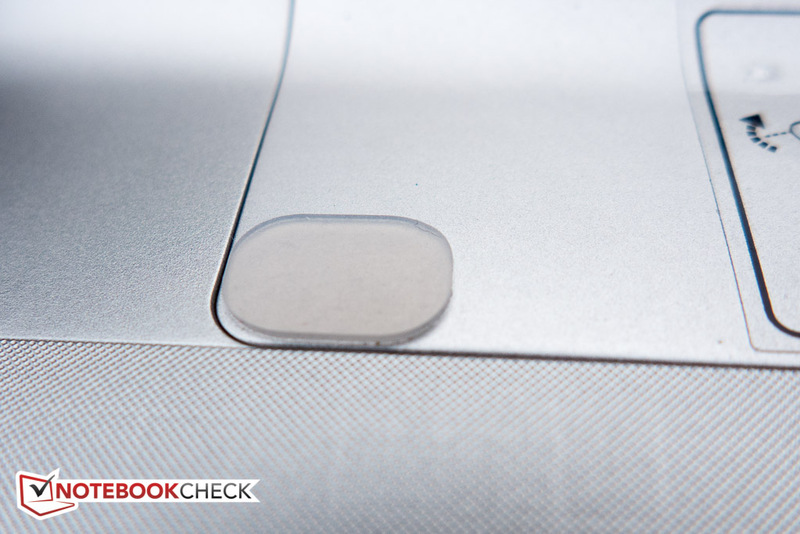 Care needs to be taken when placing the Yoga 10 on smooth surfaces without a sleeve, as it will slide around fairly easily. 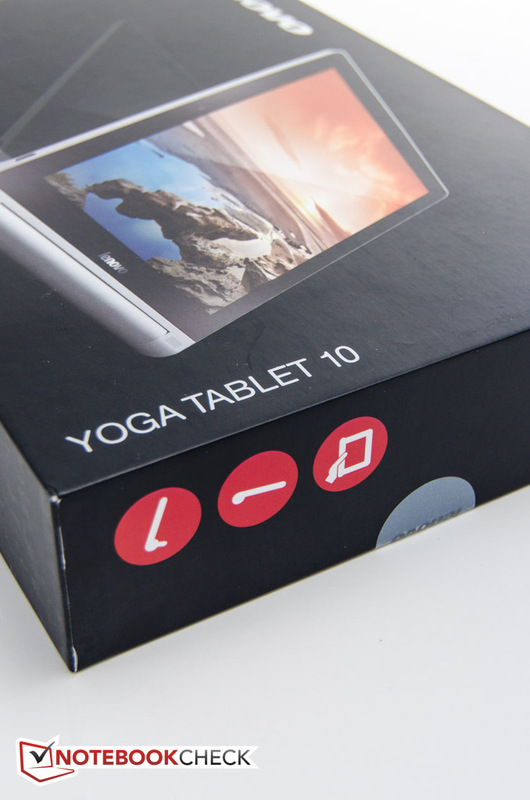 The Yoga 10 is fairly limited as far as connectivity options are concerned. 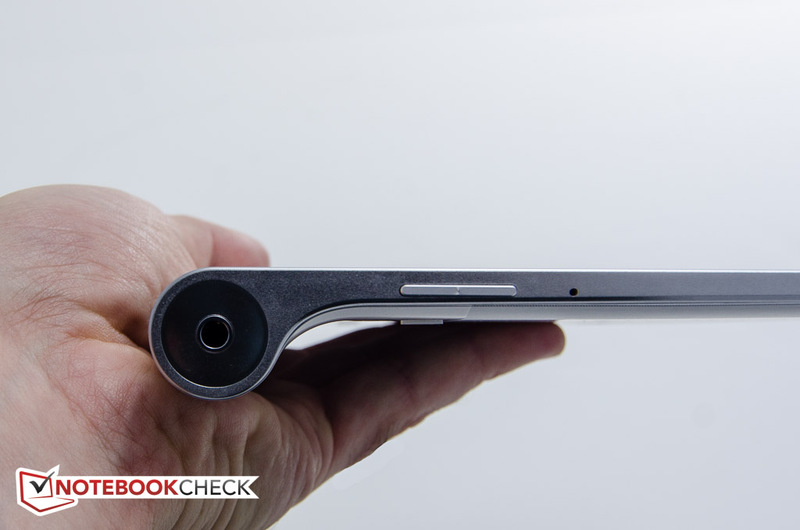 At least Lenovo offers a MicroSD card slot (up to 64 GB cards are supported) cleverly hidden behind the kickstand, which is something that Google's Nexus 10 users can only dream of. 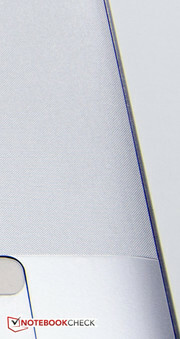 One end of the cylindrical portion houses the power button, next to it there is the MicroUSB charging port, which also supports USB On The Go (OTG). The other end houses the headphone jack followed by the - in our opinion undersized - volume rocker switch. Micro HDMI, which is something both the Nexus 10 as well as the Asus Memo Pad FHD 10 Tablet offer, is conspicuously absent. 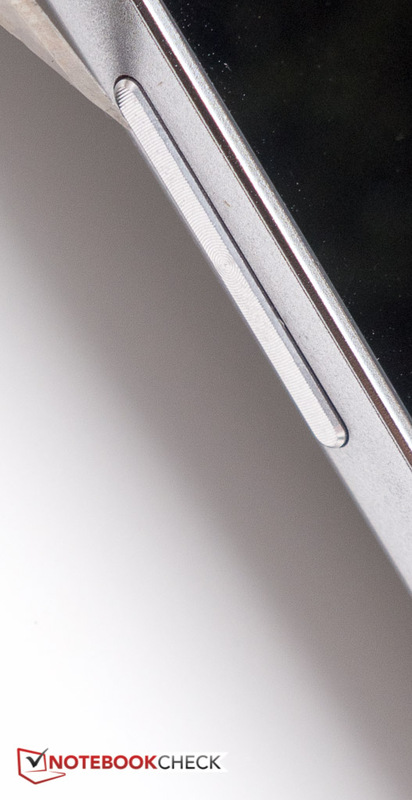 While there appear to be provisions for a MicroSIM card slot next to the MicroSD card, the North American market does not seem to get the option of cellular connectivity at this time. The built-in wireless module supports WLAN 802.11 b/g/n, but only via the 2.4 GHz band. We had severe issues with the reception quality: at a distance of about half a meter from the router, we recorded a signal strength of under 60 % with a speed of 65 Mbps. 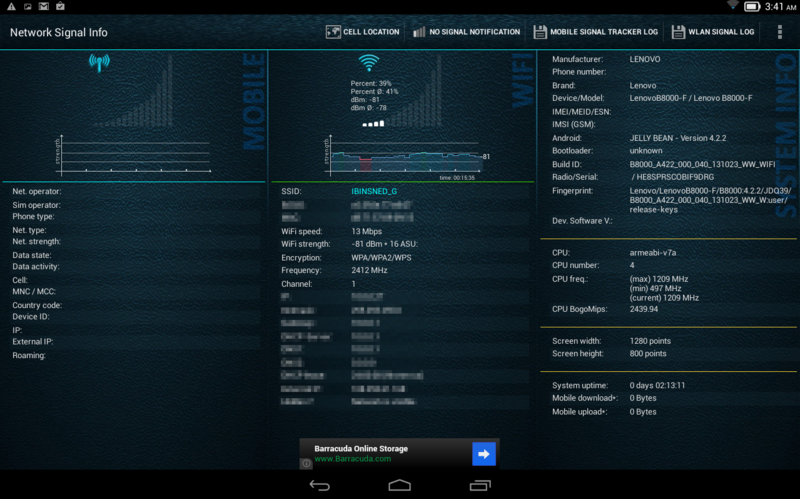 At about 6 meters, signal strength had decreased to around 40 % and the throughput dropped to less than 15 Mbps. At 10 meters, the tablet would usually disconnect completely. At least for the smaller Yoga 8, which presumably uses the same wireless card, we found some reports of users experiencing the same issues. The only fix seems to be a replacement of the unit. Bluetooth 4.0 is also supported and works without any problems. We also had issues with the GPS connectivity: during our initial and subsequent attempts, the tablet never established a connection at all. 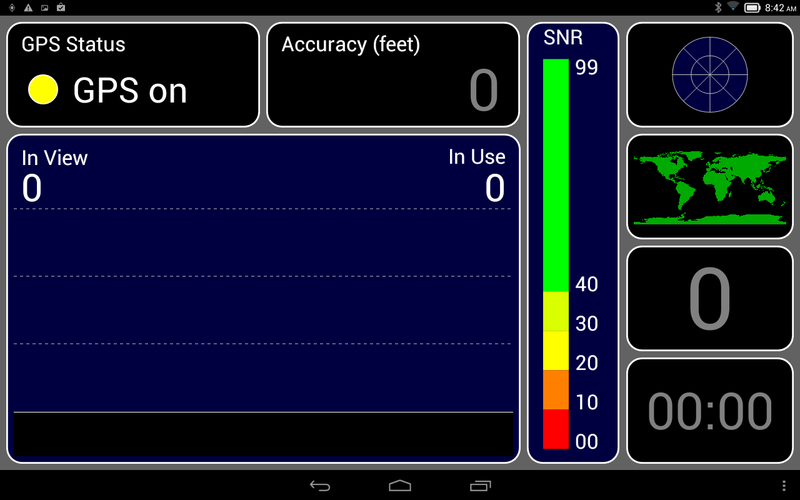 An old Galaxy Tab 8.9 was able to locate 8 satellites in just over one minute in the same location. The Yoga 10 comes with two cameras: the front-facing module has a resolution of 1.6 megapixels and is obviously designed for video conferencing. Given that the tablet is most likely going to be used propped up on its stand in landscape mode for this purpose, the location of the camera on the short side is somewhat bewildering, as the lens sits halfway down the left side from the user's perspective. 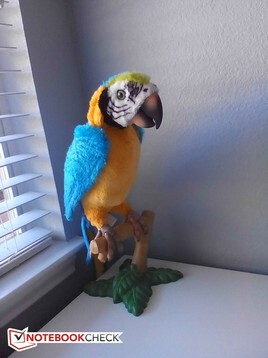 In order to be centered in the picture or video, the tablet has to be moved sideways or the user has to adjust his or her position. 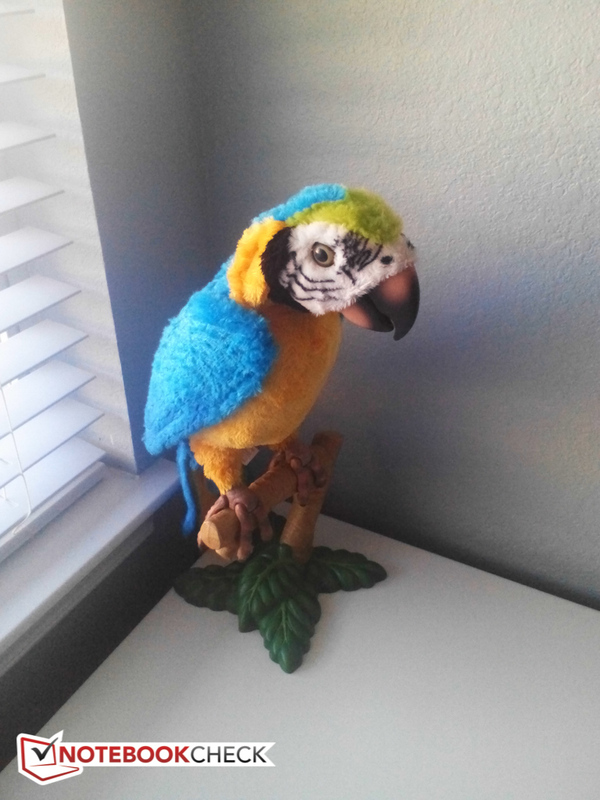 The picture quality is actually quite decent, however, and more than sufficient for the intended purpose. The higher-quality 5 megapixel rear-facing camera is located on the cylindrical portion of the tablet and can thus only be used in hold mode. Pictures are quite vivid with accurate color representation, although low-light conditions do introduce a bit of graininess and color noise. The camera application has a button for video recording so the user can seamlessly switch between still photography and video. 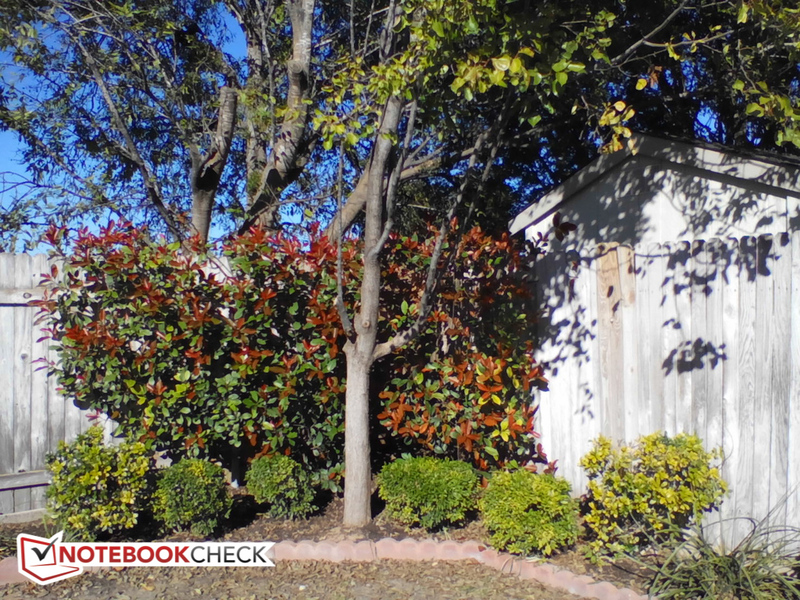 We took a sample 720p video, which showed good colors and played back smoothly. 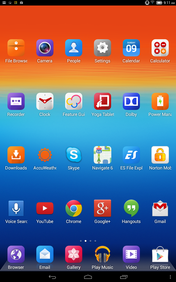 The Yoga ships with Android Jelly Bean 4.2.2, but with a customized Lenovo skin. Instead of an app drawer, all the apps are listed individually on the home screens in an iOS-like fashion. 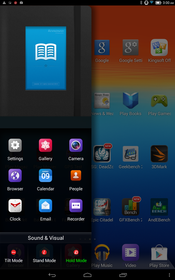 Since Lenovo also enlarged the icons and the corresponding fonts, longer names are cut off: "Google Settings" and "Amazon Kindle", for example, turn into "Google Sett" and "Amazon Ki". 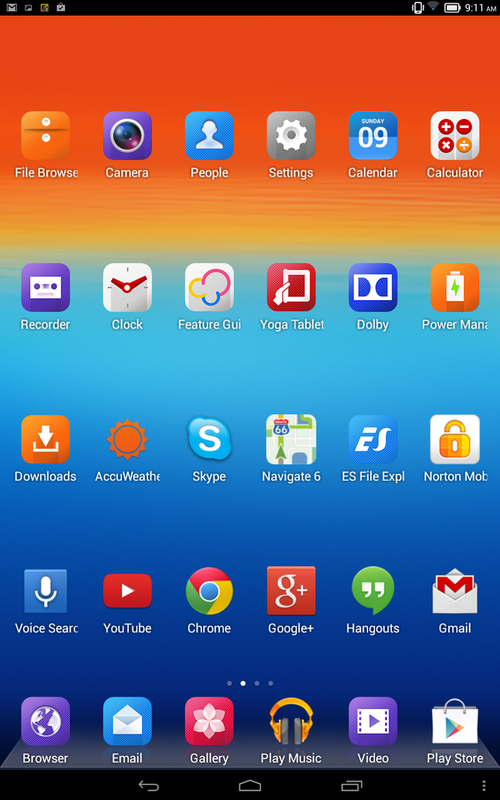 The three-dot button at the very bottom right of the home screen opens a settings menu which allows the user to change the wallpaper and theme, change preferences, and adjust the system settings. 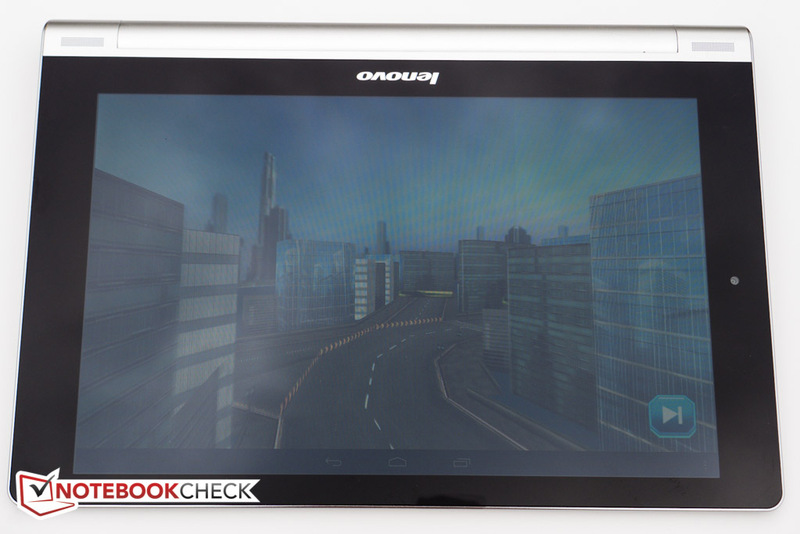 Swiping down from the top right opens the Android notification tab, into which Lenovo incorporated an option to select the mode the tablet is in. 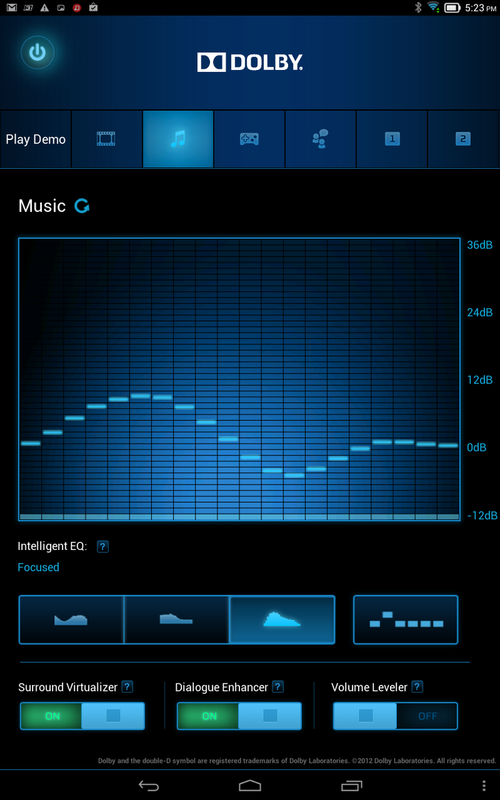 When picking one of the different modes, the audio and visual settings change accordingly: in tilt mode, for example, the settings are modified for gaming, in hold mode optimized for music and reading text, and in stand mode for movies. 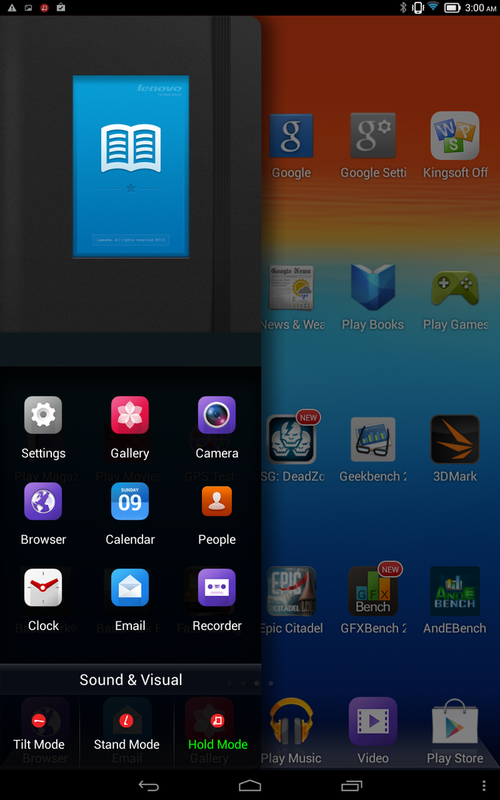 The "Smart Side Bar", which slides out from the left side and takes up half of the screen, displays recently used apps and also allows the user to change the tablet mode. 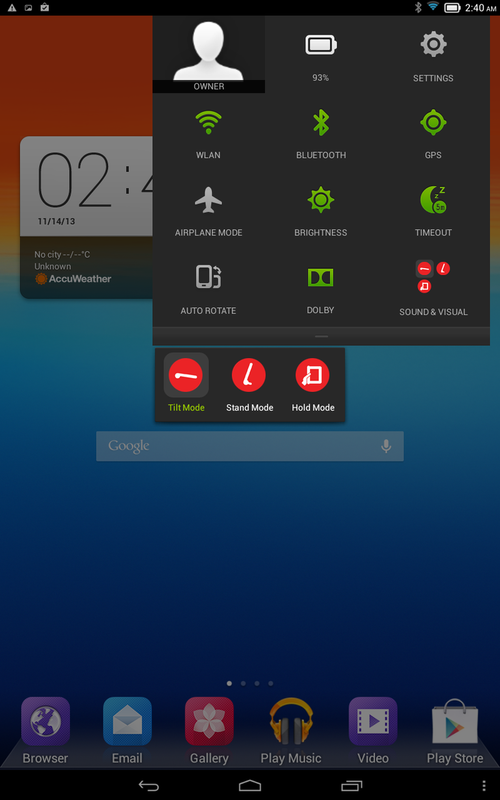 The bar can be set to "automatic mode" and then appears automatically when changing the orientation of the tablet. In addition to the standard Google apps, Lenovo adds various programs like Navigate 6 (similar to Google Maps), a power management app, Kingston Office (productivity software) and Norton's security app. 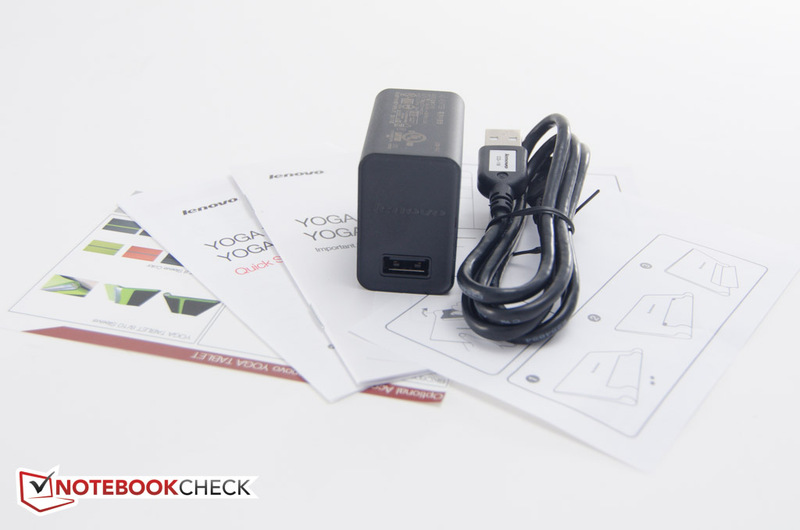 Aside from the charger and the MicroUSB cable, the box only contains a quickstart guide and various information pamphlets. Lenovo offers a protective cover for $30 and a keyboard cover, which automatically wakes the tablet up from sleep when it's removed, for $70. 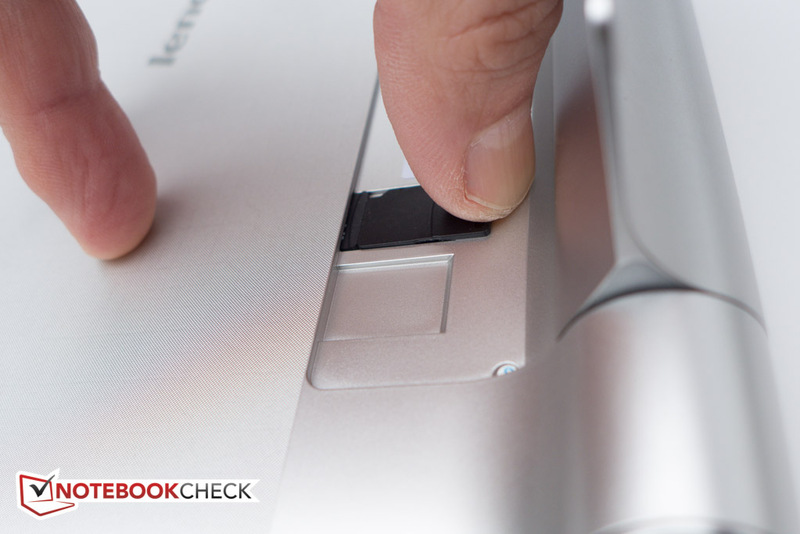 Lenovo offers a standard warranty of 12 months against manufacturer's defects. 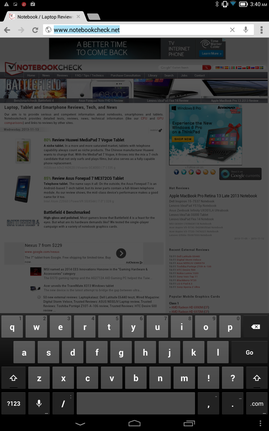 Lenovo uses the standard Android virtual keyboard. Since this is a 10-inch tablet, we had no space issues even with the smaller keyboard in portrait mode. 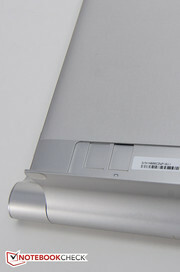 Note that the Yoga 10 includes a pager motor, so the user can enable haptic feedback if so desired. 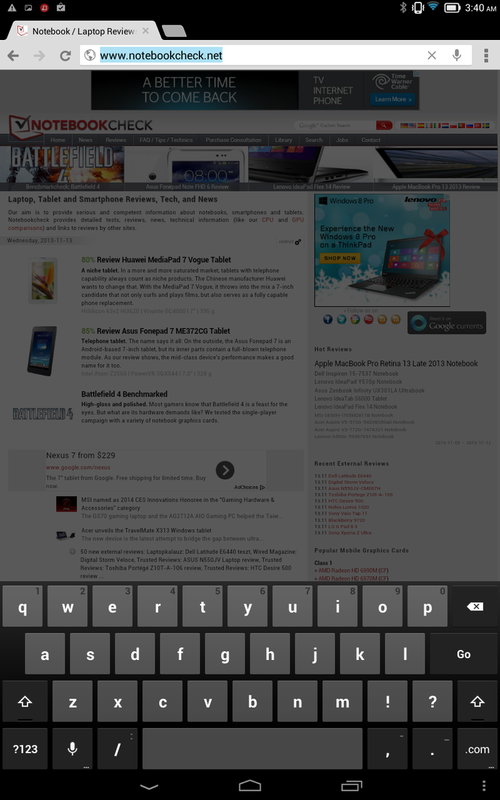 The capacitive multi-touchscreen works very well and recognizes up to 10 fingers. We never had any issues with gesture recognition and navigation was smooth and easy. The Yoga 10 comes with a 10-inch IPS touchscreen with a resolution of only 1280 x 800 pixels and a pixel density of 150 ppi. Asus' Memo Pad FHD 10 Tablet, which can be found online for the same price as the Yoga, comes with a resolution of 1920 x 1200 pixels and 240 ppi; Google's Nexus 10, which retails for about $100 more, comes with a resolution of 2560 x 1600 pixels and 300 ppi. While the resolution might still be appropriate for the smaller Yoga 8, many potential buyers will consider the lack of at least FullHD a serious drawback. Our measurements across 9 quadrants show the Yoga 10 to have an extremely bright screen: over 450 nits average is significantly higher than either the Memo Pad FHD 10 (~270 nits) or the Nexus 10 (~390 nits). 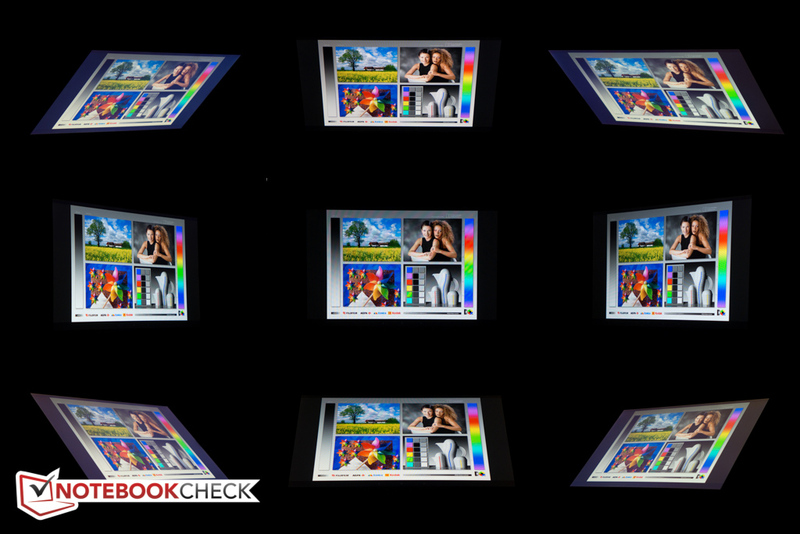 With a black level of about 0.4 cd/m² and a contrast ratio of 1222:1, the display once again does very well as far as the measurements are concerned. The Asus Memo Pad FHD 10 is slightly better at 0.2 cd/m² and 1470:1, but the Yoga 10 outperforms the Nexus 10 with 0.58 cd/m² and 722:1 by a fair margin. 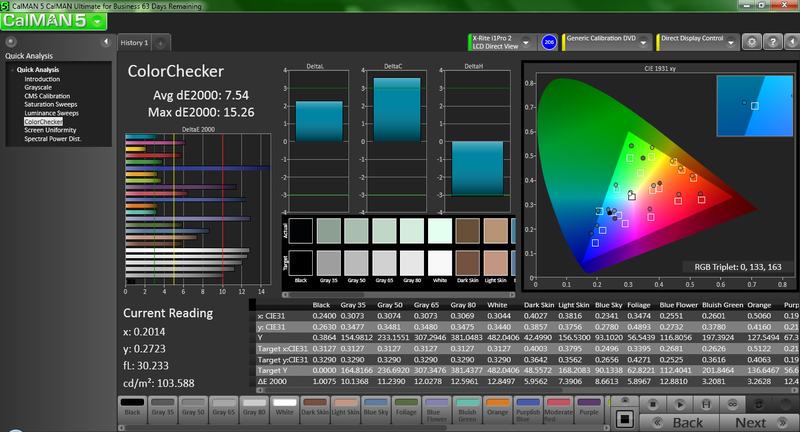 At about 6700K, the color temperature of the display is very close to the ideal of 6500K. 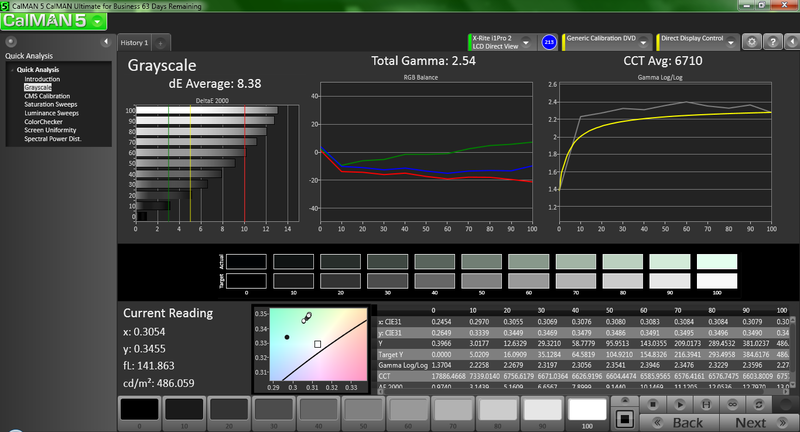 Neither the color nor grayscale accuracy are great with deltaE deviations of about 7.5 and 8, respectively. 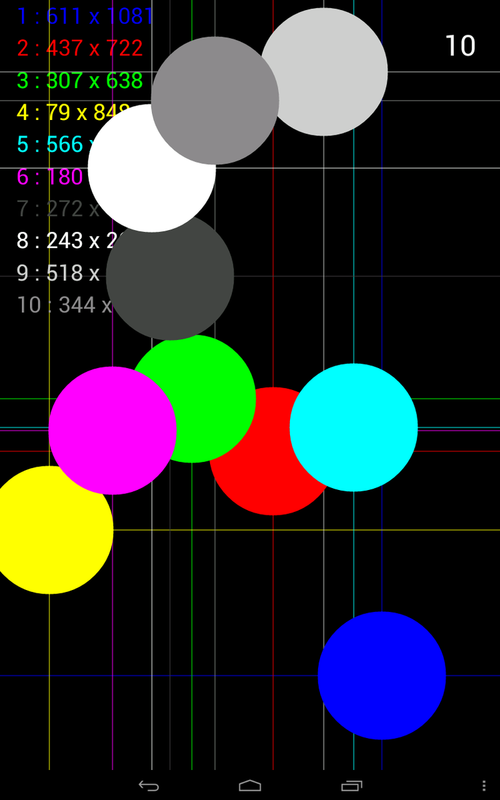 Subjectively, colors are sufficiently vivid, and blacks are nicely saturated. The low resolution definitely impacts sharpness, as small text can be blurry at times. Thanks to the very high brightness and strong contrast, outdoor usability is very good despite the glare-type display. 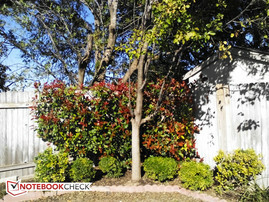 Of course, working in the shade is much easier on the eyes, but we had no issues on overcast or even on sunny days, as long as we avoided direct sunlight. As typical for displays with IPS technology, the viewing angle stability is very good no matter in which direction the tablet is tilted. Even at quite extreme angles, the picture doesn't dim very noticeable and colors don't wash out like they would on TN displays. Sharing the tablet with several other users for a movie or picture session should therefore not be an issue. 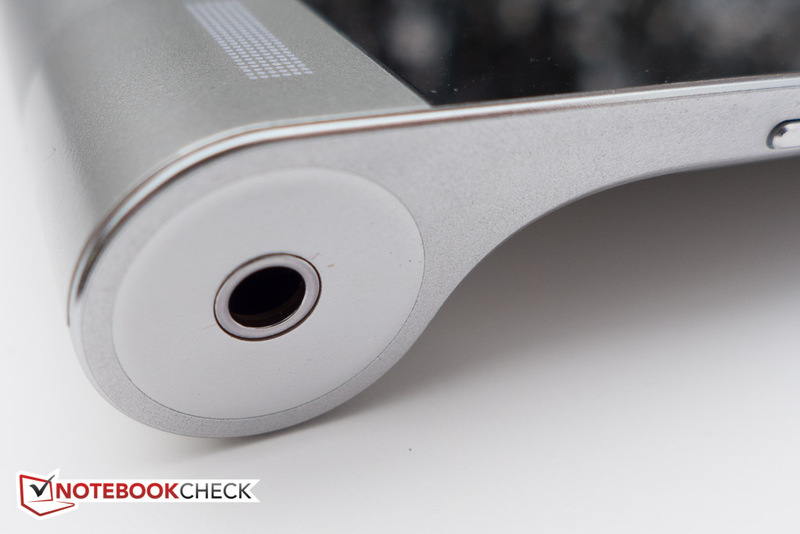 The SoC powering the Yoga 10 is sourced from Mediatek and a fairly entry-level model. 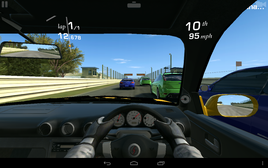 The MT8125 quad-core processor is based on the Cortex-A7 architecture and makes use of a PowerVR SGX 544 GPU. Although technically capable of up to 1.5 GHz, the SoC only reaches 1.2 GHz in this implementation. 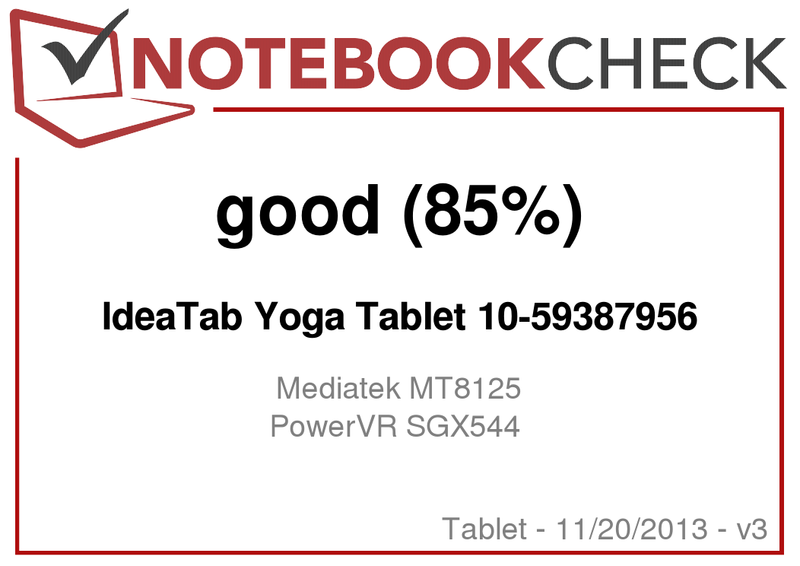 The results of the benchmark tests are generally decent, but not great: the Yoga 10 finished the Geekbench 32 benchmark with a score of 1314 points, which is slightly better than the Asus Memo Pad FHD 10 with the Intel Atom Z2560 (1233 points, - 6 %), but significantly slower than the Nexus 10 with the Samsung Exynos 5250 (1768 points, + 35 %). The smaller Google Nexus 7 2013 with the Snapdragon APQ8064A is also as quick as its bigger brother with 5080 points. 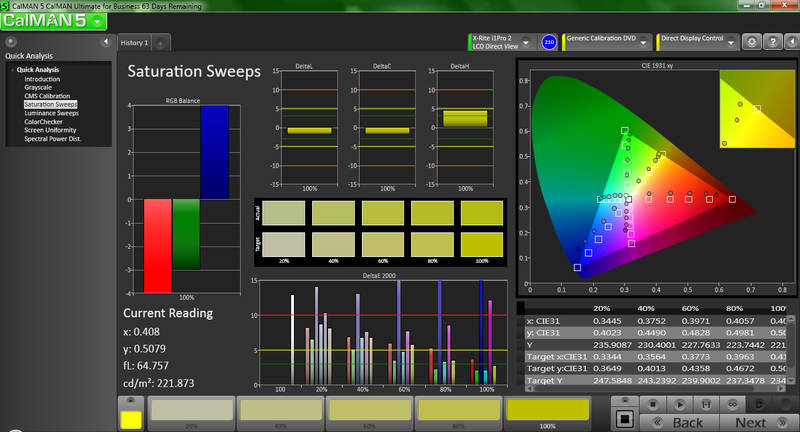 The results of Smartbench 2012 are less decisive: our review tablet scored 3723 points against the Nexus 10's 3504 points (+ 6 %). For this particular benchmark, the MT8125 performs very similar to the Tegra 3 used in many other tablets like the Acer Iconia Tab A211 (3699 points, - 0.6 %). Browser performance according to Browsermark and other benchmarks is on the same level as many of the competitors, but falls behind in the Google benchmarks: our review tablet scored 1649 points running Google V8 v7, while the Nexus 10 posted a significantly higher score of 2964 points. Overall performance is decent and opening programs, multitasking, web browsing, and navigating generally happens smoothly and without any major delays. Out of the 16 GB of eMMC flash storage, about 12.5 GB are available to the user. Since the storage is expandable via MicroSD card (up to 64 GB), the rather small size of the integrated storage is not a major concern. The read/write speeds are quite decent according to AndroBench 3: the review tablet managed 256 KB read speeds of 66.81 MB/s, which is faster than the Asus Memo Pad FHD 10 at 49.03 MB/s, but slower than the blistering 99.53 MB/s of the Google Nexus 10. 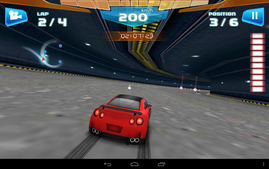 The Mediatek MT8125 SoC uses the PowerVR SGX544 GPU, which offers reasonable, but not stellar graphics performance. Epic Citadel in high quality ran at 55.7 fps, but dropped to 23.1 fps in ultra high quality mode. While the Asus Memo Pad FHD 10 had a very similar score in high quality mode, it still managed 30.7 fps at the ultra high quality setting. 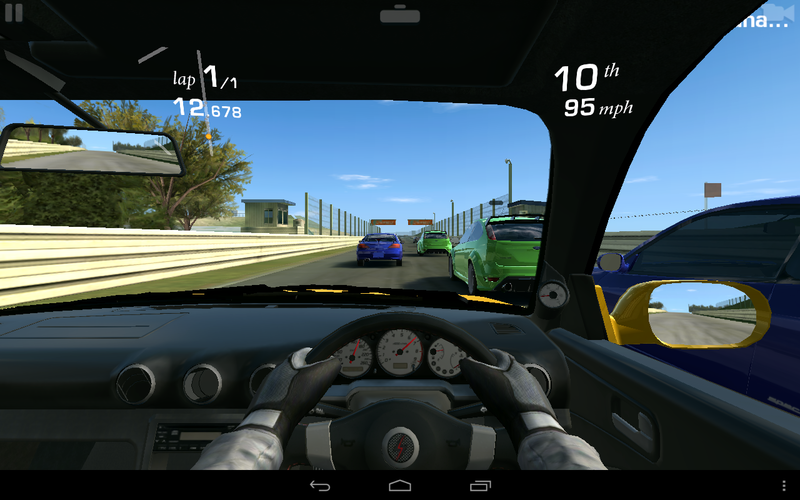 Benchmarks aside, the tablet handled most games without major issues, although the more demanding Real Racing 3 stutters visibly at times. We didn't encounter any games from the Google Play store which wouldn't work - this can be an issue with certain SoC's. During idle, the surface temperatures are close to ambient at about 27 degrees C. Many tablets have an average within a couple degrees of this measurement, but suffer from higher localized temperatures. The Asus Memo Pad FHD 10 reaches a maximum of about 33 degrees C in one area. Exposed to heavier loads and during the stress test, we recorded a high of around 40 degrees C in the middle of the display. The underside stays substantially cooler at about 32 degrees C, so holding the tablet in the hands never gets uncomfortable at all even after prolonged periods of use. (+) The average temperature for the upper side under maximal load is 29.4 °C / 85 F, compared to the average of 30.7 °C / 87 F for the devices in the class Tablet. The cylindrical spine houses two front-facing speakers on the far left and right. 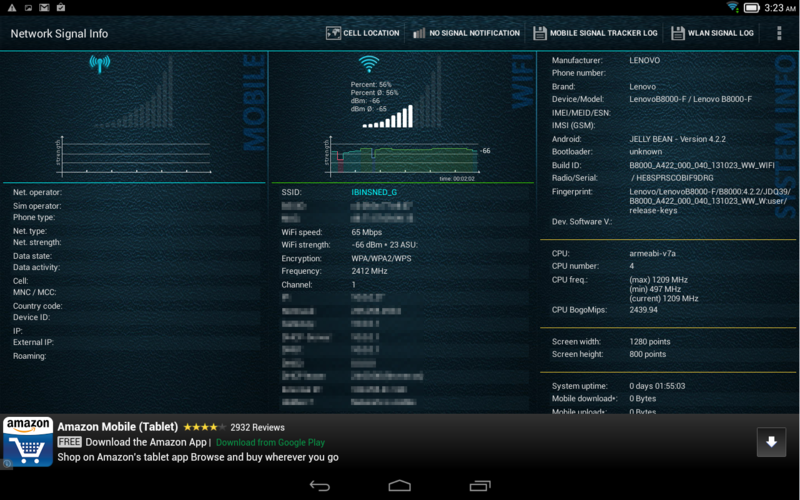 The sound quality is fairly good for a tablet and with decent mids and highs, even though bass is lacking. Although the speakers don't get very loud, at least there is no distortion even at maximum level. 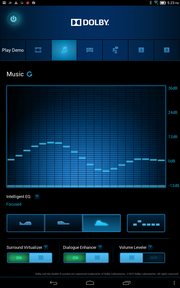 The Dolby Digital Plus technology improves the overall audio quality and allows the user to select profiles for playing music, watching movies, voice, and gaming via an app. 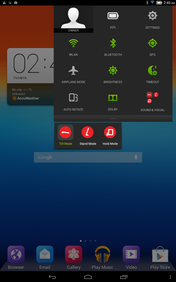 The Android notification menu also has an icon which allows toggling the Dolby enhancement on or off. 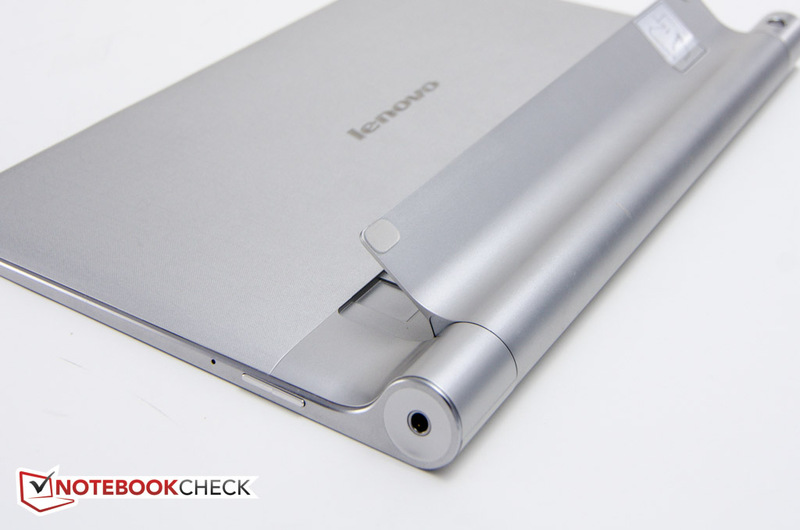 Because of the design, Lenovo was able to fit a very large battery into the cylindrical portion of the tablet. With a capacity of 9000 mAh, the battery trounces most other tablets on the market, although the power source of the Nexus 10 has an identical rating. While sitting idle on the home screen with wireless disabled and the screen dimmed all the way, the Yoga 10 lasted close to 23 hours. The Nexus 10 lasted 17 hours; Apple's iPad 4 a comparable 21 hours. To determine the minimum runtime, we run Stability Test 2.5 to stress the CPU and the GPU at the same time with the screen set to maximum brightness and wireless enabled. Given that the display of the Yoga 10 is very bright, the result of 6 hours 30 minutes is excellent. For the realistic WLAN test, we set the display to 150 nits (25 % brightness) and loop an automated script to simulate web browsing. The tablet lasted over 15 hours in this scenario before shutting down, which is substantially longer than the Nexus 10 at about 11 hours and double the runtime of the Asus FHD 10 with approximately 7 hours and 30 minutes. 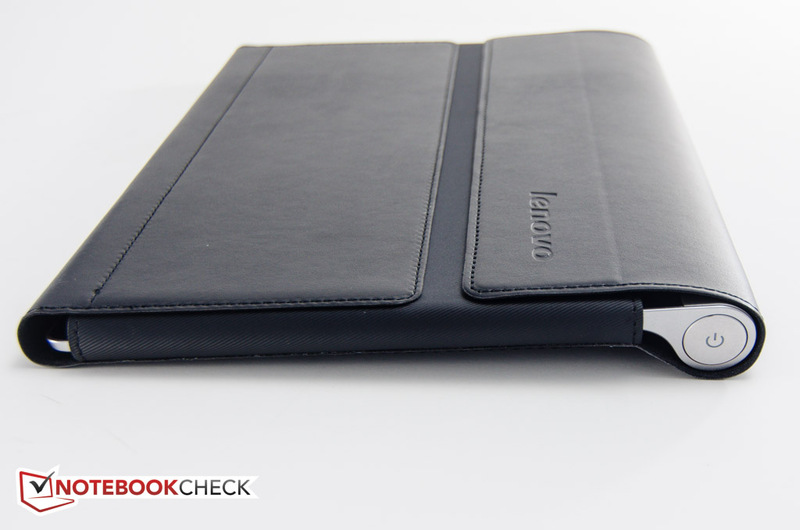 The Lenovo IdeaTab Yoga 10 is an innovative tablet with just average hardware and performance. We like the integrated kickstand, which allows the Yoga to be used in various positions without the need for an additional stand. 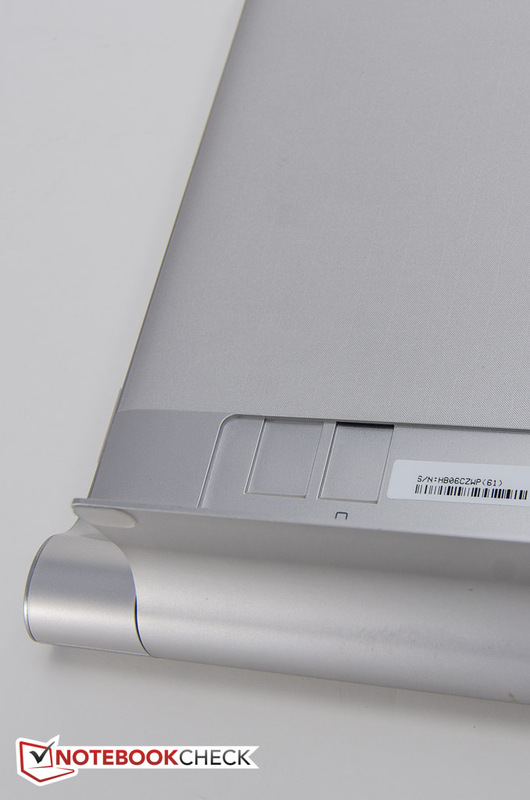 The cylindrical spine makes the tablet easier to hold than conventional designs and houses a high-capacity battery, which guarantees exceptional battery life. 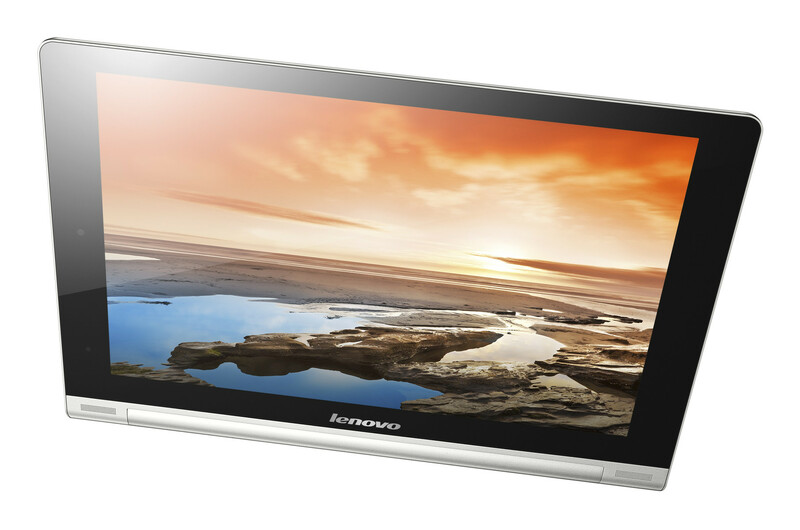 Unfortunately, Lenovo decided to outfit the Yoga 10 with a display that is hampered by a sub-par resolution more fitting for bargain-basement 7-inch models, although the brightness is outstanding. 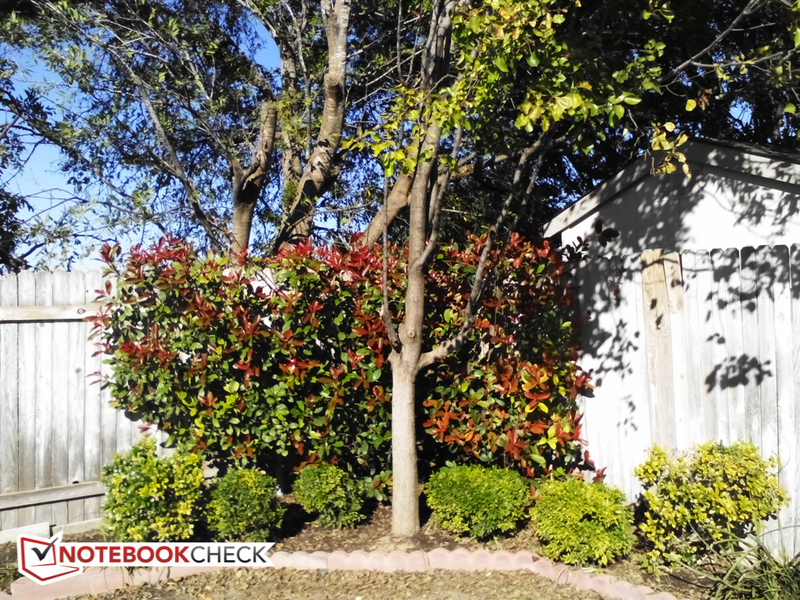 The lackluster wireless performance and the failure of the tablet to establish a GPS connection are most likely due to an issue with our particular review unit. While the ability to prop up the tablet on the table is a nice-to-have feature, users wanting at least a Full-HD display need to look elsewhere - for example at the Google Nexus 10, which retails for a $100 more but has twice the resolution and better performance. The comparably priced Asus Memo Pad FHD 10 Tablet also has a higher resolution, but somewhat dimmer display. If a slightly smaller display is acceptable, the Amazon Kindle Fire HD 8.9 Tablet is also a worthwhile choice. The innovative kickstand with multiple viewing positions and the outstanding battery life. A higher resolution display is on top of our list. 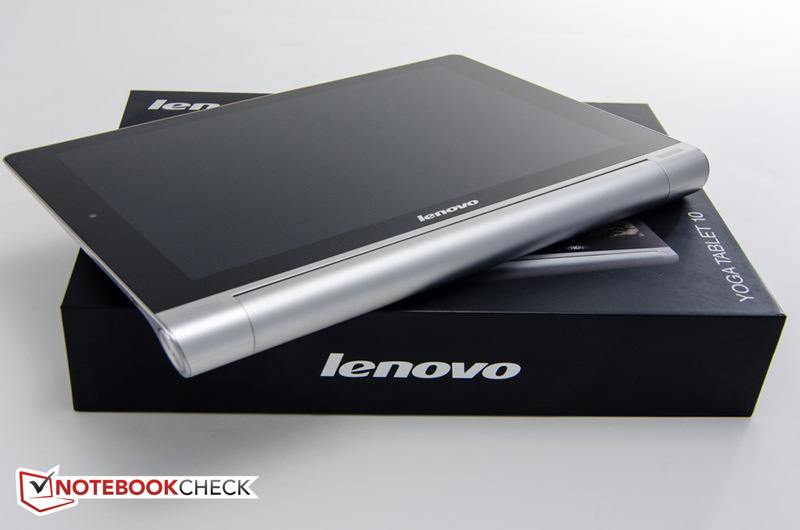 That Lenovo comes up with a fresh design but hampers it with a low-resolution display. Google Nexus 10, Asus Memo Pad FHD 10 Tablet, Amazon Kindle Fire HD 8.9 Tablet, or the Apple iPad 4.